I don't usually link to lots of news, but some really exciting things have crossed my inbox and twitter feed over the last few days. For starters, many of you probably heard back in January that the amazing fantasy magazine, Realms of Fantasy, was closing. The announcement marked a sad day for many, myself included. I'm a long time reader of the magazine, and always intended to submit a short story (but I don't write a lot of short fiction, so never did.) Well, I found out today that Tir Na Nog Press purchased RoF earlier this month! They are not yet open to fiction submissions, but the magazine will return in July. Welcome back Realms of Fantasy! I've been trying to blog regularly, but I totally failed at that goal last week. 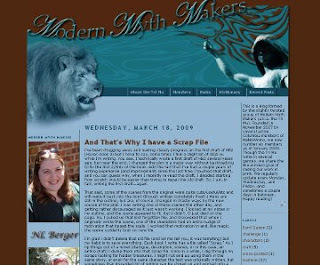 I didn't post once on my personal blog, though I did post about why I keep a scrap file over at the Tri Mu blog. This weekend wasn't as productive as I would have liked. I always hope weekends will be my chance to pull ahead, after all, they are theoretically less busy than the chaotic work week. But, alas, I fell behind instead of pulling ahead. It was my own fault. I should know by now that I am always busy. I seriously need to utilize my time better. But, hope is not lost. During my lunch hour I finished the last scene in chapter 2. The next chapter includes a scene I love and can't wait to write, and then the chapter after that (I think) introduces a new character to the series who is one of my favorite secondary characters in the book. So, hopefully the next couple chapters will fly off my fingers. That said, sometimes the scenes I look forward to most take the longest because ideas get lost between the picture in my head and the keyboard, and I struggle to get the scene right. Does that ever happen to anyone else? Wow, it's already Thursday and the fifth day in March. There is so much going on right now that I feel like I'm behind on everything. But, I'm right on target with my word count. I haven't done my writing for the day yet (darn day job getting in the way) but I'm moving along in my gradual crawl, so I should cross the 5% mark. Okay, its not a grand mile marker, but it's progress! This weekend I attended the SC Book Festival. I have been going to this particular festival regularly for the last three or four years, and I always enjoy it. This is a readers festival, not a writing conference, so I don't go expecting to learn much (though this time I did pick up some grisly details about decaying bodies from an author who co-writes with the man who started the body farm.) But, I do usually come home with a new writer (or, at least, new to me) to read. This year I went to a panel with the very interesting J. T. Ellison, and I will definitely be looking for her thrillers next time I stop by the bookstore.